Marvin Roberts, one of the Fairbanks Four, received a standing ovation when he walked onto the stage at AFN, Saturday. It was the first time Roberts had spoken out in such a public venue about the case. 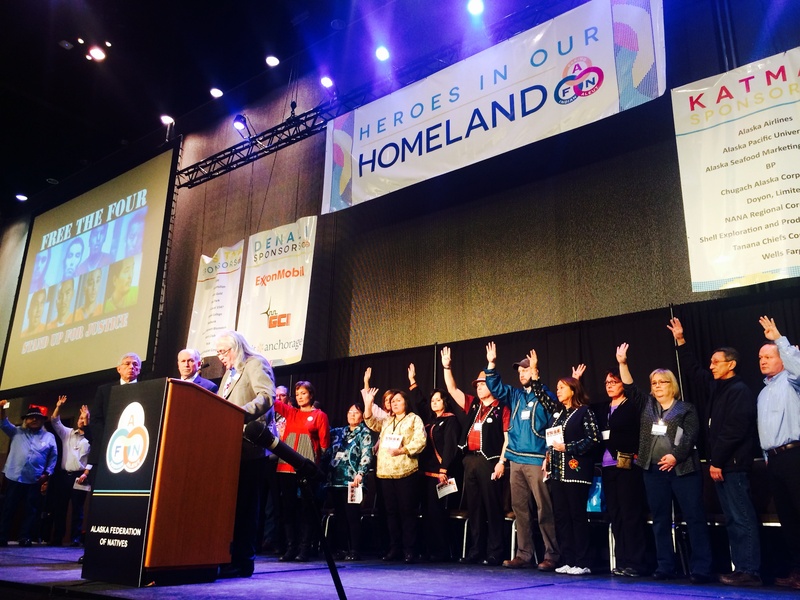 Raising an hand signing the number four became a symbol of solidarity at the 2015 AFN convention. Photo: Daysha Eaton/KBBI. Marvin Roberts described the Fairbanks Four as four men trapped in a nightmare. Roberts is Koyokon Athabascan from Tananna. He was paroled in June while the other three men, George Frese, Eugene Vent and Kevin Pease, remain jailed. Three of the men are Alaska Native and one is American Indian. The men were convicted for the beating death of 15-year-old John Hartman on a downtown street. New evidence suggests others may be responsible for the killing. Roberts said he remembers the night well. When he was 19, that the police came to take him away. He said he was asleep in his room with no worries. And he said the crying hasn’t stopped for the men and their families. Roberts called the movement to free the Four ‘miraculous.’ The case is under review in hearings taking place in Fairbanks now. There was a protest calling for exoneration of the Four during Governor Bill Walker’s speech opening day of AFN.